This reproduction of the illustrated Larousse from 1923 shows the honeycomb worm reef of the Mont Saint Michel bay, and the presence of coastguards on this site judged as being harmful to local oyster production. 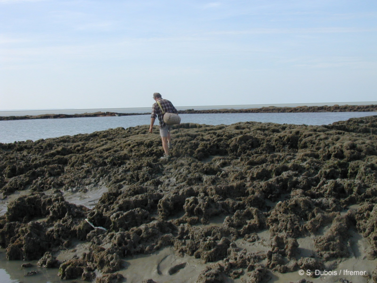 Honeycomb worm reefs are not spared by the anthropogenic pressures exerted on the coastal zone. The relationship between man and Sabellaria reefs goes back a long way and has shifted over time. In 1832, Audouin and Milne-Edwards wrote of honeycomb worm reefs as a "dangerous enemy to oysters....it would be wise to halt their progress...and destroy them". Later, naturalists such as de Quatrefages (1854) marvelled at the uniqueness and curiosity linked to honeycomb worm reefs. However in 1921, a report from the Office Scientifique et Technique des Pêches Maritimes (OSTPM) in France written by Dollfus qualified Sabellaria alveolata as an "oyster disease and enemy". 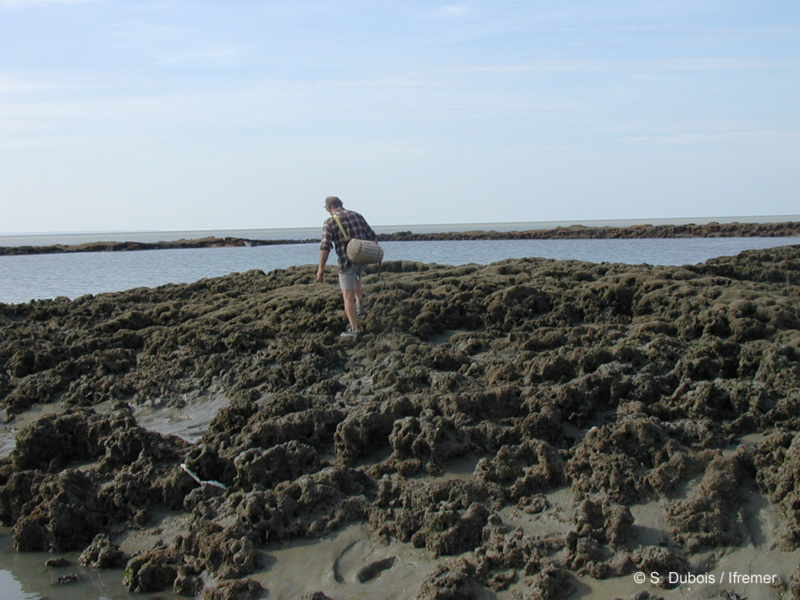 Shellfish harvester trampling the Champeaux (Normandy) reef plateau. The dark colour of the reef is a sign of siltation linked to a deterioration in the reefs' health. In France, it is only in the 1970's through the research carried out by Yves Gruet that the biological interest of, and the possible human impacts on, these bioconstructions were brought to light. The types of pressures exerted can be classified as either direct or indirect. Direct pressures take on the form of physical degradation mainly caused by recreational shellfishing. The trampling of the reefs by beach harvesters, and the destruction of reef blocks to dislodge crabs, clams, oysters or mussels represent the most visible form of degradation. Recreational shellfishing in and around Sabellaria reefs leads to a fragmentation of the reef habitat, which affects not only the diversity of the associated fauna but the very survival of the reef itself, as small blocks are more sensitive to wave action. The harvesting of epibionts such as oysters also leads to a deterioration in the reef's surface, which in turn makes it more easily colonised by oysters. The reef is then caught in a vicious circle for which there is no viable solution. Reef section almost entirely colonised by oysters. The larval inflow comes from the nearby oyster leases. Indirect anthropogenic pressures affect the honeycomb worm reefs in a more pernicious way and over a longer time frame. A look at the largest European reef located in the Mont-Saint-Michel bay illustrates these pressures. Between the reef and the waters offshore a continuous barrage of shellfish aquaculture structures can henceforth be found. 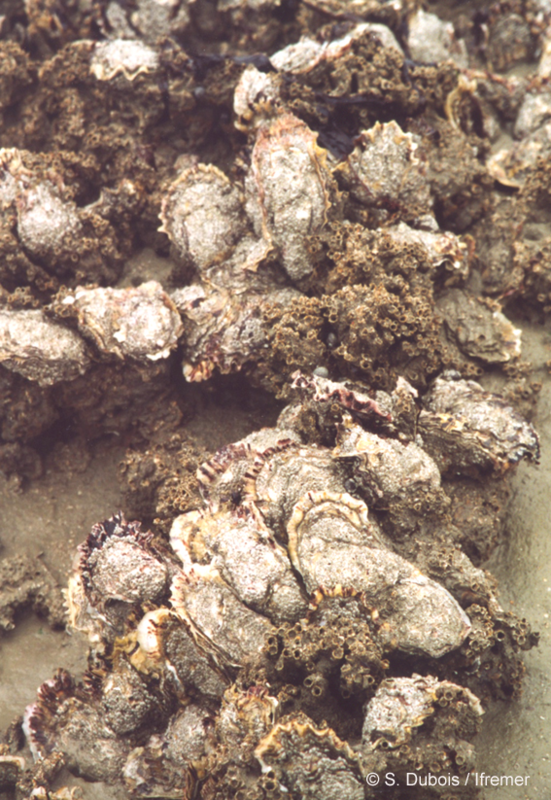 These oyster tables and mussel bouchots produce larvae which often settle onto the Sabellaria reefs (leading to the consequences listed above), sometimes covering 100% of the reef. The suffocated reef is no longer maintained by the honeycomb worms and is subsequently rapidly eroded by wave action. The large wooden poles, called "bouchots", on which mussels are farmed also modify local hydrodynamics and considerably slow offshore currents. As a consequence, immediately behind the bouchots an area of fine particle (silt) retention is created, which sediments onto the reefs. Recent studies show that a gradual siltation of the reefs and an increase in turbidity ensue, both of which considerably hinder Sabellaria alveolata feeding. 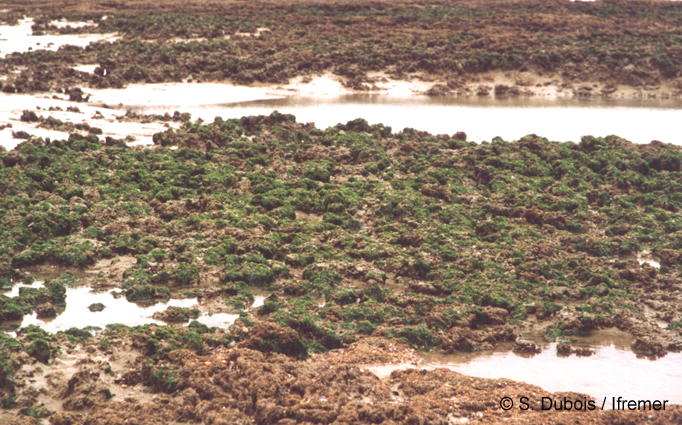 Large reef section colonised by green macroalgae (here from the Ulva genus). The seaweed appears as early as April, and its presence hinders the recrutement of honeycomb worm larvae onto the reef. Indeed Sabellaria alveolata tentacular filaments, which are used for feeding, become clogged with an increase in the silt fraction of suspended particles, which in turn means that the worms capture fewer phytoplankton (Dubois et al. 2009). Another indirect anthropogenic pressure is caused by the proliferation of green macroalgae (sea lettuce) caused by soil runoff. The reef offers a solid structure on which the algae can fix themselves, and therefore they cover large portions of the reef at low tide. However the consequences are mostly enacted during high tide, as the swaying action of the seaweed prevents invertebrate larvae from settling onto the reef. It has been demonstrated that in areas where sea lettuce develops, the reefs suffer from a deficit in juvenile honeycomb worm recrutement, which are vital for reef maintenance and resilience (Dubois et al. 2006).